Auroral oval determines the range of polar lights. It is a belt around the magnetic poles of the Earth. Its width varies depending on the so-called space weather — during the periods of low solar activity it is getting narrow, and it is expanding when there is an increase of emission of solar wind particles. 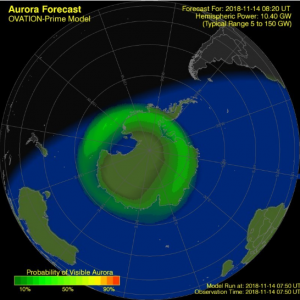 The current state of auroral ovals in the northern and southern hemispheres might be observed via OVATION Auroral Forecast section on the website www.spaceweatherlive.com. Photo: Auroral oval in the southern hemisphere, source: https://www.spaceweatherlive.com/en/auroral-activity/auroral-oval.